The model for this work was the sister of Bonnard Andre. The format of the picture and the choice of the plot reveal its connection with Japanese graphics. “The checkered blouse” is difficult to call a portrait in the traditional sense of the word. The image of André becomes here a collective image of a woman from bourgeois society, and the artist’s interest is mainly directed towards the creation of a decorative surface. 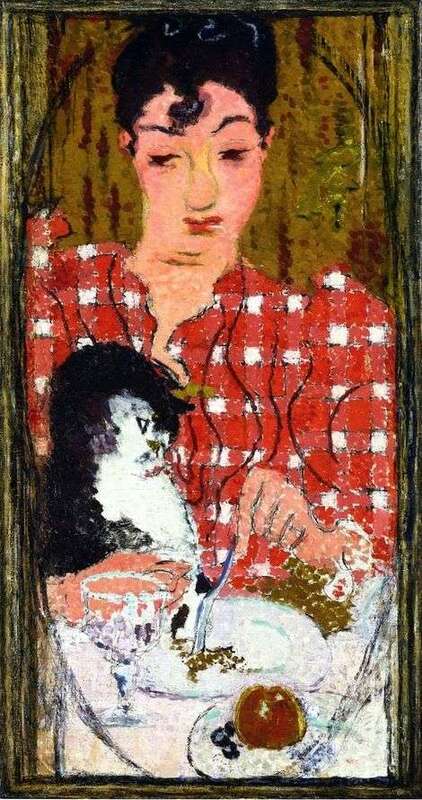 Most of all, Bonnard was attracted to playing the red-and-white mosaic plane of the blouse with a highly stylized figure of a black and white curious cat. Despite the attachment to “planes” and “surfaces,” Bonnard in this work does not completely abandon the spatial depth. It should be noted that he rarely experimented with purely planar, “abstract” forms. In “Checkered Blouse – Bonnard seeks to achieve harmony between his own perception of perspective, light and texture and the ideals of arts and crafts. Description and meaning of the painting Checkered Blouse by Pierre Bonnard.